Panasonic is set to unleash the Lumix DMC-LX5, a 10.1-million-pixel digital compact camera with an f/2 Leica-branded lens, squarely aimed at photography enthusiasts. Billed as an improved version of the firm?s two-year-old ?premium compact?, the LX3, the successor carries a redesigned CCD imaging sensor to give what Panasonic claims is an expanded dynamic range – increasing sensitivity by ?31%? and saturation by ?38%?. Improved signal processing combined with the LX5?s new sensor is said to boost performance in low light situations. Speaking at the launch, Sven Dabelstein, senior manager at Panasonic Europe?s DSC marketing department, said he sees the LX5 as a direct competitor to the Canon PowerShot G11 compact. The f/2 Leica DC Vario-Summicron lens is designed to deliver the 35mm viewing angle equivalent of a 24-90mm lens in a choice of three aspect ratios: 4:3, 3:2; and 16:9. However, a maximum focal length of 800mm is possible when combining the Intelligent Zoom and digital zoom, according to Panasonic. In Full High Definition (1280X720 pixels) movie recording the focal range equates to 25-95mm. The optic includes three aspherical lenses to help minimise distortion and the camera?s equivalent ISO sensitivity ranges from ISO 80- 12800. The hotshoe allows attachment of accessories such as an optional ’tilt-shift’ Live [Electronic] View Finder (DMW-LVF1) unit with ?100% field of view?. It is also possible to attach an optical viewfinder. The Lumix debutante incorporates a 1:1 square format setting, selectable via a switch on the lens barrel. And its top shutter speed has been quickened to 1/4000sec – double that of the LX3 which it replaces. Handling is enhanced by a ?thickened grip? and a ?turn-and-push? jog dial for selection of camera settings, says the firm. Firepower includes Power Optical Image Stabiliser, Face Recognition and AF Tracking. Three-frame auto bracketing is possible in plus or minus 1/3 EV intervals. The LX5 sports a 3in LCD screen with a resolution of 460,000 dots which is bolstered by a backlit LED to help improve visibility in bright light, for example. 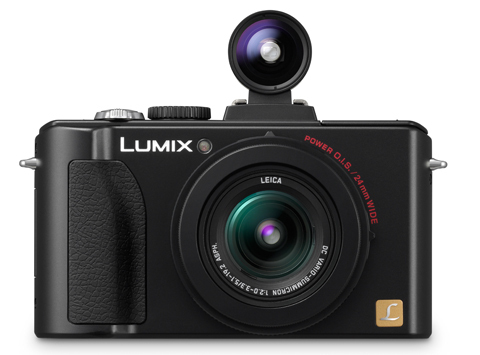 Panasonic says it is aiming the camera at professionals, high-end amateurs, or as an ?advanced camera for step-up users?. The LX5 includes Panasonic?s new Venus Engine FHD that aims to reduce noise levels and deliver energy efficiency (Panasonic claims that 400 pictures are possible from a single charge of the battery). The kit will come bundled with PhotofunStudio 5.0 HD Edition software. HDMI output will allow movies to be viewed on a compatible TV.